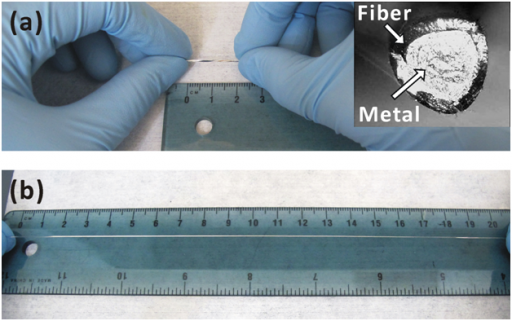 Researchers from North Carolina State University have created conductive wires that can be stretched up to eight times their original length while still functioning. The wires can be used for everything from headphones to phone chargers, and have potential uses in electronic textiles. To make the wires, researchers start with a thin tube made of an extremely elastic polymer and then fill the tube with a liquid metal alloy of gallium and indium, which is an efficient conductor of electricity. “Previous efforts to create stretchable wires focused on embedding metals or other electrical conductors in elastic polymers; … increasing the amount of metal improves the conductivity of the composite, but diminishes its elasticity,” says Dr. Michael Dickey, an assistant professor of chemical and biomolecular engineering at NC State and co-author of a paper on the research. The research was funded by a National Science Foundation (NSF) CAREER award and the NSF’s Research Triangle Materials Research Science & Engineering Center.